There is a fly shop in Redding, CA simply named “The Fly Shop.” It is one of the largest fly fishing operations around, although if you aren’t from California or Southern Oregon you might not have heard of it. They sit near a river that can be fished probably 340 or so days a year and they are an hour away from some of the best steelhead, freestone trout and spring creek fishing that California has to offer. They have grown to be one of the largest catalog operations (both on-line and the paper kind, although they launched an e-catalog this last year as well), have many private waters, a guide service and an international travel business (they even recently branched out into real estate too). A guy you might not have heard of there is Bill Marts. 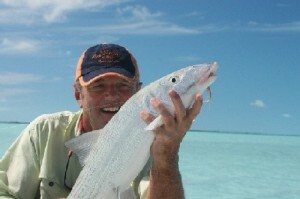 Bill is a Destinations Specialist and the resident saltwater destination guru with The Fly Shop. He’s had the good fortune to fish for bones all over, catching his first in the Keys in 1982 (I was 8 and it would take me 26 more years to catch my first). Bill agreed to answer a few questions about his bonefishing life. 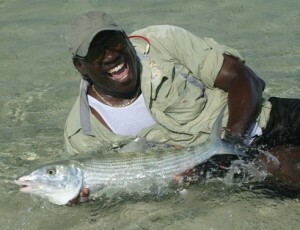 Bill, as the saltwater specialist at The Fly Shop, you’ve had the opportunity to fish all over the world for bonefish. Is there a location that you still are itching to explore? I am itching to explore any saltwater knee-deep or less. I would love to go to the Mauritius. I would give my next to the best fly rod to be able to go back to the Cook Islands and Tuamotu Islands to poke around. Not because the fishing was so outstanding, but they are such wild places and you can walk for miles without seeing anyone (and sometimes without seeing any bones either), and just walking the flats is an enjoyable pastime. Don’t get me wrong, I DO like to catch fish and it always adds to a trip or outing, but it can still be a good trip without “off-the-charts” fishing. I like seeing new places and finding what it has to offer. Maybe it is not bones, but another fish roaming the shallows. It seems that there are big fish locations and many fish locations. Would you rather have shots at fish all day long or would you rather hunt the really big bones? I am not single minded, but I would normally rather fish for fewer big fish than a lot of smaller ones. But more important is the actual fishing for them. If there were hundreds of big fish in a mud, and even though they are big and you could catch a lot of them, it would not be fun. But an 18” tailing fish that has to be stalked and the wrong cast will spook it, now that is fishing! So what I really like is the hunt, the circumstances, and the surroundings. When looking for a place for clients at the office, these are the kinds of things I like to find out about him or her. Of all the places you’ve fished, is there one fly that pretty much works everywhere (or do they all pretty much work everywhere)? In addition to working in The Fly Shop Travel Dept, I am also a signature tier for Idylwilde Flies and I like nothing more than to tie up new patterns and color combinations and take them for a test run. But one fly goes to every flats destination I go to and that is a Gotcha in sizes 2 through 8, and heavily weighted to hardly weighted at all. I do find that darker or olive or mottled flies tend to do better over grass flats and the whites, browns and tans work well over sand. Flies should be chosen for their color and characteristics (lots or no movement, rubber legs or no legs, weight or no weight, big or small). I also like a little pink or orange in the fly somewhere on some flies. I say “you can’t take too many flies on a trip.” So, I try to cover all of the bases on the flats, over reefs or in the blue water. Do you have one fish that really stands out in your memory? One special fish, for whatever reason? Yes. I was fishing with a guide named Alvin out of Kamalame Cay, on Andros Island. We’d had a good morning of wade-fishing and I wanted more, so Alvin put me on a shoreline flat that was also a bay with rocks scattered throughout the its mouth. The boat with Alvin sitting in it was anchored and I was standing outside of it leaning up against it having lunch, eating a sandwich and drinking a beer. We saw a good sized fish slowly making its way toward us and very close to the boat and we both thought it was a small shark. After it got within two rod lengths of us and head away, we both realized it was a big bonefish. Alvin started going nuts claiming its size to be about twice what it really was. But he was at one time praying, yelling, whispering and stuttering. I followed the fish and cast and cast and cast and kept following it for over a hundred yards. I could hear Alvin following along behind me. I saw the fish was heading to a shoreline where I hoped it would take a right and follow that shore. So I started cutting it off. I made my last “hail Mary” cast. It landed behind and off to the right of the fish, but I was using a big fly and the fish saw it, turned, cranked up the speed and ate it. I really couldn’t believe it, but it was on and heading directly for the boat and the ANCHOR ROPE! So Alvin took off running across the flats and turned the fish before wrapping the line. It then took off for the rocks. Alvin really wanted this fish. He took off after it again and turned it again, finally toward me. I did get it in and was reaching for it when it slipped of the hook. I couldn’t believe it and I hung my arms and head down. I looked upon hearing Alvin running across the flats, yet another time. He was after the fish, AGAIN. I had to get a picture of this. As I was getting my camera out I heard a big splash (Alvin is well over 6 feet tall and WELL over 200 pounds). He was lying on his side in the water. I was getting closer to him to take a picture of him and saw the most satisfied grin on his face and he pointed under him. Then he pulled out the fish. No, it wasn’t as big as he first thought, but it turned out to be a very memorable one. Great story with the picture too. A rarity. Beyond the most obvious things (rod, reel, polarized glasses), what’s the one thing you never leave for a trip without? It is a small thing, but makes casting (and catching fish) easier and more accurate. I always take a fly line cleaner and use it often. Even if the line mfg claims it doesn’t need it, I still use it. When wading, the line stays floating behind me and therefore picks up off of the water easier, making a longer more accurate cast easier. It shoots through the guides easier and is less likely to tangle. When someone calls The Fly Shop and wants to catch a bonefish, do you match them up with a location based on what they are looking for, or do they come to you already set on a destination, even if it might not be right for their skill level or expectations? The biggest reason I went to work for The Fly Shop a little over five years ago was its attitude towards its traveling clients. It is drilled into our heads that we work for them (the clients), not the lodges. But by doing this we are also doing the best thing for the lodges. We always try to match up our clients with the exact right fit regarding their destination. My best tool is asking questions. Even if someone calls and wants to go to a specific location, I still ask away. I like to find out why and how they came to this conclusion. I would only send someone to a destination that I didn’t feel right about if the clients insisted and I said what I had to say. There are good and unique qualities to all of our destinations and we try to line up our clients with the one that meets their expectations. Do you have a favorite bonefishing rig? I like a #7 or 8 fairly fast action rod (like the Sage TCX #7, or Xi3 #8), floating tropic line (Rio Bonefish or Sci Angler Redfish) and 9’ – 12’ fluorocarbon knotless leader (I prefer no knots because they can catch on coral or grass and cause breakage). Many people think of long casts and accurate presentations when it comes to bonefish. What’s the SHORTEST cast you’ve ever made to catch a bonefish? When fishing in Los Roques in the late ‘80’s, I was getting ready to get out of the boat and my fly was dangling over the gunwale, maybe 2 feet under the surface. You guessed it. A bonefish ate it and I landed it before getting in the water. At another time and in another place I was wading the flats and was changing my fly. Just as I knotted the new fly on and was getting ready to start working out line, I saw a bone making its way to me about 15 feet away. I didn’t dare cast or move too much or I would spook it. So I tossed the fly with my hand to the water in front of me (3 feet from my feet). I froze and when the fish got close I just twitched it slightly. The fish jumped on it right away. It took off, wrapped me around some coral and broke me off; about that quick. So, although a long cast isn’t necessary to catch fish, I maintain that the farther one can cast accurately, the more fish will be caught. This applies to windy as well as calm days. This does not mean that one has to cast far to catch fish only that more fish will be caught with longer casts. But, we all know that numbers don’t make the trip, so no matter how far one can cast, there is no excuse for not going to a bonefish destination. I always advise clients heading to the flats for the first time to take some casting lessons from a qualified instructor (one who has fish the flats). Even if the client has fish for decades in fresh water, a lesson from a saltwater casting instructor will improve their chance on the flats. Flats fishing is different that freshwater fishing. Where are you headed for your next bonefishing trip? I don’t know yet. Probably the Bahamas. There are a lot of islands and flats I haven’t waded there, yet. What happens when you go to a place to fish bonefish and they just aren’t there, for whatever reason? Take the blinders off and look for other species. Almost all flats (or close to them) have a good barracuda and/or shark population. They will attack a fly and give a good account of themselves. I discovered the fun of fishing for and catching triggerfish on a recent trip to Christmas Island. I would never over look them again. A great gamefish. I may have my mind set on a certain path for catching a single species or size of fish or whatever restrictions I may set on myself for a certain trip. Sometimes this works out. But one thing I’ve learned is that the narrower the agenda you set for yourself, the more likelihood of failure. If one says “I am going on a fishing trip” and goes on that trip, it is a success. If the agenda is to catch a ten pound bone and one isn’t caught, the trip is a failure. I have widened my agenda tremendously in later years and I have had so many successful trips. This entry was posted on Tuesday, April 27th, 2010 at 3:19 am	and is filed under All the other stuff, Fish Tails, Gear. You can follow any comments to this entry through the RSS 2.0 feed. You can leave a comment, or trackback from your own site.